Varanasi, better known as Benaras, is one of the oldest living cities across the globe. The city is well connected to various other cities of the country through rail. Varanasi Railway Station, (Varanasi Junction), commonly referred to as Varanasi Cantt Railway Station, is the largest train station in the city. Over 3.6 lakh passengers and 240 trains pass through this station every day. Varanasi is known to be an important and major railway junction. The city is served by several major trains from all metros and cities across the country. 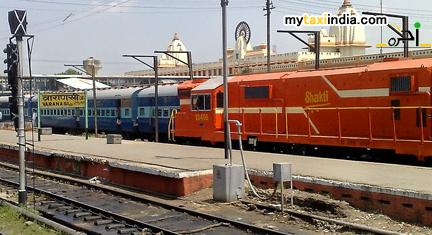 The city has direct connections via rail to all major cities of India including Mumbai, New Delhi, Kolkata, Chennai, Meerut, Gwalior, Indore, Allahbad, Guwahati, Lucknow, Dehradun and many more. Varanasi is the oldest city of the country. It is an important pilgrimage center for Hindus. To be in Varanasi is a unique experience in itself. One can literally experience self–discovery and eternal union of the body and soul. Varanasi guarantees a breathtaking experience for every tourist. The city attracts millions of people from all across the globe. Varanasi has been famous for spiritualism, Indian philosophy, mysticism, and much more. These elements are beautifully reflected in a number of temples, sects, ghats, and ashrams across the city. The city boasts of magnificent Stupas and Jain temples. Once here, you can visit the archaeological museum at Sarnath houses. These are home to many remains of the past such as the Ashoka pillar. Some of the other major tourist attractions of Varansi City include the Ganga Ghats (river fronts), Alamgir Mosque, Durga temple, Tulsi Manas temple, Vishwanath temple, Sankat Mochan temple, and the Bharat Mata temple, the Archaeological Museum, Sarnath, temples, Bharat Kala Bhavan, Buddhist Stupas and temples at Sarnath. Hiring a taxi in Varanasi will help you enjoy the tour better. At My Taxi India, we ensure you efficient car hire, airport and railway transfer services within and outside the city of Varanasi. The quality of services offered here has won us a reputable rank in the industry and unwavering trust from customers. We take special care of customer’s comfort, and security all through the trip. The official portal of our company offers timely and updated info about services offered. The major emphasis is always on adopting latest technology and communication tools and techniques to guarantee timely services for departure and arrival airport services. Hiring a car to the railway station is not a problem. All you need to do is reach out to our branch in Uttar Pradesh personally or book a taxi online. Either ways, you can rest assured about best facilities, updated info, competitive prices from us. Our fleet of cars is readily available for Varanasi tour and railway transfers. Book a taxi with MY Taxi India and give us a chance to serve you.